Choose either a Hormann Promatic or Hormann Supramatic remote control garage door operator and you will be choosing one of the quietest, most reliable and fastest electric openers on the UK market. Now the series 3 with new state of the art Bi Secur technology - 2 way communication for the radio controls and 128 bit security encryption. Security is one of the main issues concerning remote control garage door openers and Hormann have the answer in their patented locking mechanism. When a Hormann Promatic or Supramatic operator has closed the garage door not only does the motor and drive unit hold the door firmly closed but a unique patented steel 'hook' device locks the garage door towing arm in place to avoid potential forcing of the door. The device is purely mechanical and therefore will work even in a power failure. This device is in addition to the motor holding the door closed providing one of the most secure operators on the market. Uninvited guests don't stand a chance with a Hörmann electric automatic garage door. When the garage door is closed, the patented door security kit automatically engages in the operator’s guide rail stops, locks immediately and is secured against forced opening. In contrast to other electric operators, Hörmann’s door locking process is purely mechanical and therefore functions without a power supply. You will find this combination of speed and convenience unbeatable. Your garage door opens faster, you can switch on the garage lighting separately and there are literally hundreds of additional control accessories that can be added to ensure complete control whatever your requirements all with Bi secur technology. State of the art Hörmann Supramatic E remote control operator and supplied with the standard K boom for operating sectional doors up to 2125mm high and fully retractable up and over garage doors up to 2250mm high. Full installation instructions, two hand held transmitters and 5 year guarantee are included. See the video below. The ProMatic garage door operators feature the same proven Hörmann technology as all Hörmann premium operators. This guarantees reliable function – at an attractive price. The new Bi secur function offers a lot of technology for future proofing your garage door opener and allowing 2 way communication with the operator and hand set. The superb Hormann Promatic E remote control operator is supplied with the standard K boom for operating sectional doors up to 2125mm high and fully retractable up and over garage doors up to 2250mm high.Two transmitters, full installation instructions and 5 year guarantee are included. Many optional extra accessories are available for Hormann electric operators to help tailor your garage door opener control to your lifestyle. This ranges from handheld remote controls to cigarette-lighter buttons and wall-mounted keypads. Wireless keypads, various key switches, timers, card readers and many other items also give a wide choice of access control. Recent advances have brought leading edge technology products such as electronic finger readers to the Hormann range of operator controls. These will recognise up to nearly 100 individual fingerprints for the ultimate in external security access control at very affordable prices. Thanks to Hormann technology, multiple handsets can be programmed to control the same operator and other home devices - electric gates, lighting and so on. The Hormann sectional garage door possibly offers the highest level of security when combined with a suitable Hormann remote control electric operator unit. The design of the sectional door gives the highest level of resistance to break in by force and the double skinned panel design gives maximum panel strength. 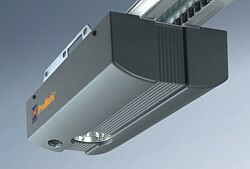 Hormann have the patented latching device built into their upmarket operators for the ultimate security as shown above. 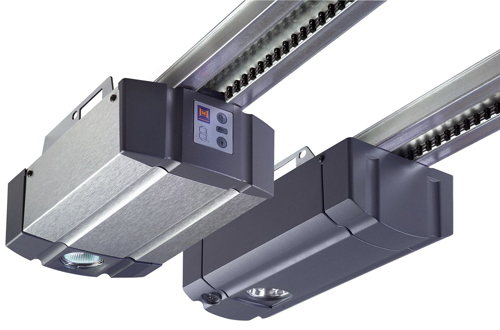 Hörmann’s doors, operators, and rails form a compact, permanently connected unit. Additional control units and exposed, movable connecting leads are not necessary. Reinforced with aramid fibres, the Kevlar toothed belt is particularly tear-resistant and quiet-running. No greasing or oiling necessary, which is a major advantage over chain drive or spindle operators. A strong spring mechanism always tensions the toothed belt automatically, thus ensuring uniform, smooth running. The exceptionally flat boom - only 30 mm high - means that the operators are easy to mount onto any commercially available garage door and are therefore also ideal for retrofitting. Centre installation of the operator rails on the door leaf results in uniform pull forces on the door. No canting, no wear, which is frequently the case with e.g. operators installed on one side. connection profile of a Hörmann sectional door (up to 3000 mm door depth). Suspension from the garage ceiling is not necessary. An additional advantage: Just one suspension is sufficient, even for long rails. Fits all commercially available up-and-over and sectional doors. To conveniently open the door from the inside in the event of a power failure. On almost any retractable garage door we have always recommended the use of a 'security de latch' mechanism as this simple and effective device allows the manual rod and slam latch locking of the garage door to be worked automatically with the electric operator. There are a few models and they are usually only around the £45-£65 and worth every penny. Choose either a Hormann Promatic or Hormann Supramatic remote control garage door operator and you will be choosing one of the quietist, most reliable and fastest electric openers on the UK market. 24V DC motors provide smooth quiet operation combined with a unique nylon/kevlar drive belt you can be assured you are getting the very latest in electric operator technology to give years of trouble free service. You will find this combination of speed and quality unbeatable. Your garage door opens faster, you can switch on the garage lighting separately and there are literally hundreds of additional control accessories that can be added to ensure complete control whatever your requirements. Door opens faster due to the higher opening speed of up to 50 % for sectional doors. Separately switchable halogen lighting via your hand transmitter or the IT 3b optional internal push-button unit. Additional opening height with the individually adjustable second opening height you can ventilate your garage without having to fully open the door. 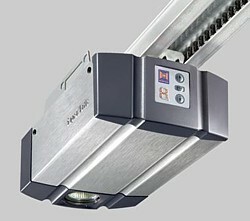 The Supramatic and Promatic operators are available with three different boom lengths (K, M and L boom) for nearly every height and type of garage door available and three different variations of power output from the motor unit to ensure there is a motor for every weight of door as well as high useage commercial doors used in car parks. 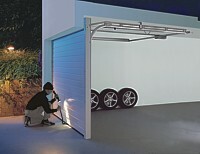 The Promatic garage door operators feature the same proven Hörmann technology as all Hörmann premium operators. This guarantees reliable function – at an attractive price.